With urbanization being a common theme for the future, urban agriculture has long been considered a possible solution to growing food while also reducing human impact on the environment. Farming in cities “takes the form of backyard, roof-top and balcony gardening, community gardening in vacant lots and parks, roadside urban fringe agriculture and livestock grazing in open space” (Urban Agriculture, 2016). Such changes that urban agriculture would demand are under intense scrutiny. Questions arise as to whether it can be applied on a large enough scale to be of any worth, and whether the costs of implementation might be too high compared to those of current agricultural practices. The current practices are unlikely to ever be discontinued, though they are proven to have unmistakably negative environmental impacts. Such impacts are especially evident in those cases which employ the use of chemical fertilizers, synthetic pesticides, and industrialized machinery (Industrial Agriculture, 2013). The value of urban agriculture lies in places other than largescale application, however. Not only are its methods more environmentally friendly, it could also have a potentially remediating effect on the damage urban activity is exacting on the environment. Van Leeuwen et al. (2010) acknowledges a wealth of services vegetation performs, “all contributing to a healthier urban climate for both humankind and nature” (p.21). These broadly embody moderation in one form or another of rainfall, erosion, temperature change, and solar radiation, all of which take place in urban settings. Van Leeuwen et al. (2010) also discussed the theme of organic methods and community effort common within the modern practice of urban farming (p. 22). Research into its key functions such as decreased land-use and pollution mitigation have proved to be potentially beneficial. However, concerns abound for its capability of being sustained long term, the cost of implementation compared to traditional agriculture, and if this implementation is plausible on a larger scale. The root of doubt ultimately lies in the risk of adopting a more invested system of urban agriculture. The question is whether such implementation will result in a progression toward healing the bond between humans and nature, or if it might just prove to be an irreversible blunder. In many ways, the value of urban agriculture lies in its potential to address concerns raised by urban development and human activity. Ackerman et al. (2014) explore one of the environmental benefits of farming in cities. The authors introduce the phenomenon of the “Urban Heat Island (UHI)” (p. 192), the observed higher temperatures in urban areas relative to nearby rural areas. One of the primary reasons for the rise in global temperature is the excess of greenhouse gases, mostly CO2, which trap the heat from solar radiation reflected from Earth’s surface, instead of letting it back through the atmosphere. Not only do cities give off more heat because of their high levels of human activity, they also give off more emissions because of this human activity. Consequentially, their “micro-atmospheres” trap more heat. In addition, the abundance of steel, glass, and other reflective surfaces in such a closed area act like a series of mirrors, reflecting solar radiation instead of absorbing it. Thus, cities are typically found to be warmer than other areas, anywhere from 0.6°C to 12°C warmer (Ackerman et al., 2014, p. 192). Enough plants in an urban setting, Ackerman et al. (2014) claim, would provide several benefits. These benefits are akin to those global ecosystem services rendered valuable to the entire human race. One obvious service is the shade larger plants like trees would provide. In general, leaf cover “blocks and redistributes incoming solar radiation and diffuses light reflected from nearby urban surfaces” (Ackerman et al., 2014, p. 192). Barring agriculture, such an effect can be achieved with simple planting on roofs and roadsides. However, introducing the agricultural element would afford green spaces the additional function of providing food. While an increase in planting and greenspaces in cities helps to mitigate the effects of human activity, the UHI may not be an entirely negative development. George et al. (2008) observe the effect of the urban microclimate on plants. Warmer environments created by cities, specifically Baltimore in this study, seem to result in a higher plant biomass, particularly with perennials. Over the period of five years, the cumulative plant biomass and speed of succession in the urban area were both greater than that of the suburban and rural sites (George et al., 2008, p. 641). Biomass, however, is not the only measure of value. One must also view the diversity of the plants that grew at all three sites, that is, the variance in the species that grew there. By the end of the five years, annuals were all but absent from the urban site, with perennials, particularly the woody variety, being the most dominant (George et al., 2008, p. 642). George et al. (2008) offered the explanation that annuals, more akin to pioneer or primary succession plants, cannot compete well for resources against the larger perennials. Here is seen the ecological phenomenon of secondary succession. By contrast, there was a balance at the other two sites between the annuals, herbaceous perennials, and woody perennials at the end of the five year period (George et al., 2008, p. 642). Perhaps, though, if the study had proceeded for another five years, they would have observed a similar process of secondary succession in suburban and rural areas, but at a slower rate than in the urban area. This may appear to be a positive development, though more research is necessary to understand its full extent. Considering, the aforementioned functions of plants in cities, and those arising from increased secondary succession, may help to cool these urban microclimates. In addition to heat and emissions mitigation, urban farming may have an effect on the storm water that falls in cities, in terms of both volume and quality. Green roofs are proven to reduce storm water runoff by anywhere from about 52 percent, all the way to 100 percent (Ackerman et al., 2014, p. 193), since the plants themselves take up water as part of their biological processes. They also are found to have an effect on the water they do not take up. Whittinghill et al. (2016) studied the effects of different greenspaces in New York City on storm water. The greenspace studied was a rooftop farm, and the pH levels, conductivity, turbidity, and apparent color of its runoff were compared to those of non-vegetated rooftops, previously studied greenspaces from other literature, and unaltered rain (that which did not fall on greenspaces) (Whittinghill et al., 2016, p.199). This runoff comparison revealed pH levels to be much lower in the rainwater than that of the runoff (Whittinghill et al., 2016, p. 199). Such levels are within the EPA’s parameters of safe drinking water, which lie between 5 and 9 (Whittinghill et al., 2016, p. 198). This is perhaps evidence to suggest that city greenspaces can help neutralize the acidity of rainwater. In addition to storm water purification, Leake et al. (2009) point out that “potential health benefits [of urban farms] may significantly offset or compensate for the apparently minor risks that follow from the higher loads of environmental pollutants” in urban settings, such as fertilizers, pesticides, and other emissions (p. 5). Many of the benefits encompassed in urban farms are, however, would still hold if they were merely urban greenspaces. Once the need to grow crops for food is introduced, a new set of complications arise. Although there is significant advantage to urban agriculture, it is not without its limitations. Concerns about urban agriculture seem to reveal several limitations present not only within its own system, but also in the current system of its implementation. Two of the seemingly largest concerns for largescale urban farming are to create an environment suitable for growing plants, and to find enough space in cities to grow them. While rooftop farming is not affected as much by these concerns, they must be addressed for ground-level urban farming, if that is to be implemented. One basic need of plants is light. While, plants could still be grown outdoors in urban environments, the potential for complication is greater considering the presence of skyscrapers and the shadows they cast. Another necessary resource is arable soil, and contaminated soil, being a common occurrence in urban areas, poses an obstacle to this necessity. LaCroix (2014) singles out lead as an especially prevalent and problematic contaminant. Its sources include “lead-based paints and leaded gasoline.” Although these have long since been “phased out of production,” their dangerous by-products still linger in the soils of many older urban areas (LaCroix, 2014). Other contaminants consist of various solvents, including organic compounds, compounds derived from fossil fuels, and other heavy metals (EPA, 2011). Not only do these contaminants pose adverse effects, they can reach humans in a variety of different ways. Skin contact is the most direct, but contaminants can also be absorbed from the soil by plants and incorporated into their tissues (LaCroix, 2014). The concept of biological magnification dictates that concentration of a contaminant increases as it travels through the tissues of successive trophic levels in a food chain (Tran, 1999). Since humans would be consuming the plants grown in the contaminated soil, the concentration entering the human body is even higher. Despite the aforementioned positive effects of a rooftop farm on storm water runoff, Whittinghill et al. (2016) found a few negative impacts as well. The authors acknowledge the variation of climate from area to area (p. 196). This presents the difficulty of drawing a definitive conclusion about the positive effect of greenspaces on storm water. Another concern is the concentration of macronutrients introduced into the storm water through the plants. The use of fertilizers and organic matter like that found in compost introduce another level of complexity into the storm water mitigation system. The farm Whittinghill et al. (2016) studied released runoff with significantly high levels of nitrate, ammonium, phosphorus, potassium, calcium, magnesium, and sodium compared to the storm water that did not fall on the farm (p. 200). Nitrate and phosphate are of especially high concern. High enough levels in the waterways in and around cities lead to eutrophication, algal blooms, dead zones, and the eventual and undesirable degradation of surrounding ecosystems. Some of the nitrogen and phosphorus could perhaps be absorbed by landscape surrounding the runoff area, potentially serving as an additional agricultural zone. Although the concentrations of macronutrients in runoff from this rooftop farm are lower compared to those from traditional agricultural runoff, some levels still exceed EPA guidelines for safe exposure (Whittinghill et al., 2016, p. 203). Waters running from urban farms could also potentially carry pesticides with them. These waters are reaching and disturbing local natural water systems, whether through point sources such a discharge pipes running from urban sewage, or through nonpoint source, meaning diffusion through the land that absorbs the water (LaCroix, 2014). While creating a suitable environment for starting and maintaining a farm may be a matter of planning and gradual remediation in cities, spatial considerations present entirely different difficulties. In the way of scale, one must ask whether a city-wide network of urban agriculture would be implemented with the intention of feeding and sustaining some of its inhabitants, and consequently, how much space would be required to accomplish such a goal. Kessler (2013) recognizes the advantages of vacant lots and empty rooftops and making them green. Other possible spaces include parks, old playing fields, and even cemetery land. Though Pfeiffer et al. (2013) acknowledge that the “development of urban agriculture enterprises is strongly influenced by access to land” (p. 82), the problem truly lies in spatial limitations and the parameters these impose upon the degree to which urban agriculture can sustain even part of a city population. Such an ambition would seem to undermine the real potential of urban farming on a smaller scale, and would perhaps dissuade people of its potential entirely. Ackerman et al. (2014) provide results from a multi-year study from the Urban Design Laboratory at the Earth Institute, examining the plausibility of adequate food production from urban farms in New York City, as well as implications for the sustainability of such an undertaking. They found a correlation between “inadequate healthy food access, high incidence of diet-related diseases, [and] greater percentage of vacant land” (p. 196). Thus the spatial distribution of potential farming areas is conducive to produce demand. That being said, acreage estimates for sufficient land to grow produce range from 162,000 to 232,000, but the actual estimated capacity of potential growing spaces fall vastly short of these figures (Ackerman et al., 2014, p. 195). These findings, however should not deter plans of implementing urban farming where it is possible to do so. Another large concern seems to be the degree to which the installation of an urban farm from site to site fluctuates in cost. Pfeiffer et al. (2013) have found that “availability and affordability of urban land can vary tremendously” (p. 82). Included within this variability would presumably be the unpredictability of the cost of site treatment. Is the land to be privately or publically owned (Angotti, 2015, p. 338)? Would the farm be commercial or local and affordable (p. 338)? And while the land can be found, bought, and treated, gaining access to other resources adds another level of complication to the spatial issue. Water, for instance, is not readily available in all areas, and so “access to a reliable water supply…can also limit site selection” (Pfeiffer, 2013, p. 84). On a sociological note, Angotti (2015) notes the danger of romanticizing urban farming. Building and maintaining a farm of any kind entails hard manual work that “can either address or exacerbate deep divisions of class, race, gender, and age” (p. 339). In the way of additional costs after installation, one must ask whether would labor be paid or unpaid (p. 339). If urban agriculture were implemented with high enough degree of intention, it could very well become its own industry, demanding its own force of paid workers, a point of success. On the other hand, urban farming could be viewed as a community undertaking on a local level, aimed at volunteering, cohesiveness, and group responsibility. The more urban farming grows as an idea and a reality, the more diverse it becomes, as noted by Cohen et al. (2015), “in terms of goals, forms and participants” (p. 104). Because of the vast expansion and diversification of urban agriculture, as well as a lack of coordination between already existing farms, difficulties arise in determining “how to effectively allocate resources to support” it (Cohen et al., 2015, p. 104). A network of urban agriculture as can be presently visualized with all these stipulations taken into consideration is patchwork at best, hardly an integrated system, but a network nonetheless, and a very feasible one at that. Barring its many limitations, urban agriculture should be viewed as a thing to be improved and built upon. As it is, solutions, amendments, and additional considerations in light of its apparent shortcomings are not entirely absent from research. For instance, LaCroix (2014) details practices used to make soil more conducive to this new sort of land-use. She warns against the immediate planting of “root and tuber crops” whose edible parts have direct contact with the contaminated soil, and instead recommends starting with plants that produce aboveground fruiting bodies. The EPA (2011) also suggests ways in which prospective urban farmers can help to avoid adverse effects of contaminated soil. One passive solution—passive in the sense of not adding anything to the system—is the use of raised beds (p. 6). A few active solutions employ the use of “soil amendments to stabilize contaminants” and the replacement of contaminated soil with “clean soil” brought in from somewhere else (p. 6). One common amendment is compost, whose organic material helps to dilute the contaminants in the soil (p. 9). One long-term, but more natural approach uses “phytotechnologies, which utilize plants to extract, degrade, contain, or immobilize contaminants” (p. 6). To prevent the previously discussed bioaccumulation through the food chain, these plants require special disposal (p. 6). By contrast, Leake et al. (2009) report the active replacement of the entire topsoil at one site (p. 4). However, such undertakings as or similar to this are labor- and cost-intensive (Kessler, 2013, p. A331), which would impact a cost-benefit analysis of starting an urban farm in the first place. Systems already in place, such as Pittsburgh’s AgRecycle, are capable of providing such services as soil replacement and amendments city-wide (AgRecycle, 2016). Although some of the more organic and passive methods presented for remediating soil entail gradual, long-term processes, ultimately contaminants can be cycled out, providing a more conducive growing environment for urban agriculture. In answer to concerns about urban farming, water supply and quality must also be addressed. The issue of supplying enough water to urban areas for farming presents another challenge to cost-benefit analysis of urban agriculture. In many areas of the country according to Smith (2008), the cost of potable is higher than that of raw water, which refers to “untreated, nonpotable agricultural water” already used for traditional agriculture (p. 98). Previously, potable water was much cheaper, but over the years circumstances have reversed, and although the majority of the water supply in urban areas is used to water the landscape, many systems do not have a supply of the now less costly raw water. Smith sets forth a dual system of irrigation, one with potable water and one with raw water for urban landscape irrigation, typically supplied to agricultural lands by “mutual irrigation companies,” or “ditch companies” (Smith, 2008, p. 97). Such a system, Smith argues, could be applied to urban areas (p. 97), in which case the raw water would be the portion provide to farms in the cities. Storm water is a resource to be taken advantage of for watering urban farms, but as mentioned before, the quality of this runoff is a potential issue. While there is a specific standard yet to be determined for appropriate macronutrient levels in this runoff, there are methods for mitigating the impact it has on surrounding natural ecosystems. Whittinghill et al. (2016) suggest a simple reduction in the loading of fertilizers and pesticides. In general, an organic approach to farming is more desirable for minimal environmental impact. Permaculture is one such organic technique used with increasing frequency. The word “permaculture” combines the words “permanent,” “agriculture,” and “culture” (Akhtar et al., 2016, p.32). It is defined as a “land use and community building movement which strives for the harmonious integration of human dwellings, microclimate, annual and perennial plants, animals, soils, and water into stable, productive communities” (Diver, 2014). While it is by no means specific to urban farming, it could prove to be an invaluable asset to the movement itself. Adaptation on the part of humans would mean adopting such a way of thinking and growing food that will help to reduce the need for manmade pesticides and fertilizers. Thus, with the further mitigating attribute of permaculture integrated into its design, urban agriculture could be presented as an attractive alternative to traditional industrialized agriculture. Permaculture is more than just a method, though, it is a theory of human interactions with the rest of nature (Akhtar et al., 2016, p. 32). It is a set of ethical constraints that dictates the design of sustainable farming systems, something which Akhtar et al. (2016) use to propose a more natural scheme of management. Most commercial and industrialized agricultural systems revolve around vast plots of a single crop, such as those seen in American cotton, corn, and wheat fields (Industrial Agriculture, 2013). Contrary to this practice of monoculture, permaculture involves the “exploration of nature’s pattern” (Akhtar et al., 2016, p. 32). It acknowledges and employs not only the functions performed by the elements of a natural system, but also the interrelatedness of such a system and its elements. When considering the long-term sustainability of permaculture the concept of regeneration is crucial. Rhodes et al. (2015) include it with their suggestions for permaculture. They define it as the idea that “a completed object can generate more energy than was used in its own manufacture,” which they describe as “emergy, or embodied energy” (2015, p. 404). For instance, a wind turbine would be regenerative if the energy cost of its manufacture and installation was at some point surpassed by the amount of energy it produces during its lifetime. That is, if it produces enough energy to make another one. Such a concept can be applied across a plethora of processes, but we will maintain focus on what it means for urban farming. In terms of food production, a system is regenerative if it employs a constant cycle of feeding by-products of its crops back into the system itself (e.g., composting plants post-harvest and leaves dropped from city trees to use as nutrient rich soil for the next planting) (Rhodes et al., 2015, p. 404). Included in the design Rhodes et al. (2015) set forth is the idea of “resilience” in which the system can maintain a given function in several different ways (p. 404). A greater level of resilience would seem to arise from a greater diversity of elements in the system. Ensuring a certain yield from a system with less resilience would perhaps demand artificial forcing for greater output than is natural, an example of non-regenerative farming. Such artificial forcing could come in the form of fertilizers, which would introduce further toxins into the system and aforementioned runoff. It could also come from machinery fired by fossil fuels, which would introduce further emissions into the atmosphere. Less energy focused on artificial means of growing food and more energy focused on employing an organic and more naturally-oriented means would perhaps result in less environmental contamination. Permaculture paired with urban agriculture would by no means replace traditional agriculture, but may help to mitigate its environmental impacts in providing a potentially competitive alternative to growing food in cities. In addition, urban farming integrated with these organic approaches would offer better locally-sourced food options, and would perhaps lessen the demand for more highly-processed and non-regenerative foods while increasing overall health. While the complete dependence of cities on their urban agriculture seems unattainable given the results from Ackerman et al. (2014), it is not to say local production cannot be greatly beneficial. For example, some crops need very little space to grow, making their growth in urban settings more favorable (Ackerman et al., 2014, p. 195). Combined with biointensive methods, Ackerman et al. (2014) estimated that the amount of tomatoes consumed each year in NYC could be grown on just 8,260 acres (p. 195). In addition, these biointensive methods require less than half the normal amount of water and land, and little to no fertilizer (Ecology Action, 2006). For over forty years, John Jeavons, the director of Ecology Action, has been educating communities around the world on the biointensive method, providing information on effective farming to the public (Ecology Action, 2006). Peiffer et al. (2013) introduce similar ideas of “space-intensive” growing, which implement “dense spacing and intercropping,” as well as an emphasis on careful “field design” (p. 88). Another solution is to create a suitable year-round conditions conducive to growing, instead of relying only on the warmer months (Pfeiffer et al., 2013, p. 88). As a way of extending the growing season, greenhouses are often implemented, which trap heat from solar radiation and keep an area warm even during colder months. Sethi (2009) experimentally determined the optimum rooftop greenhouse design and orientation for the highest absorption of solar radiation. The greenhouse with an “uneven span” (meaning larger south-facing roof and wall than north-facing) and an east-west orientation was found to receive the highest amount of solar radiation (p. 53). The design has a sloped roof and vertical sides, in contrast with designs of slanted sides or arched roofs, which were found not to absorb as much solar radiation (p. 47). This difference in designs and orientation illustrates the importance of careful planning in urban agricultural technique for maximum crop yield. Another concept prevalent today which addresses the spatial problem is “Zero-Acreage Farming” or ZFarming. The intention of ZFarming, as described by Specht et al., (2014) is to “create entities linking food production and buildings with multiple uses of residential or industrial waste resources (e.g., waste water, waste heat, organic waste) to establish a small-scale resource saving system” (p. 34). Similar to the aforementioned permaculture, ZFarming contains an element of regeneration in its design, since it is cycling various types of waste back into the system. Although its name implies no use of space whatsoever, ZFarming, and especially a largescale application of such, is by no means truly “zero-acreage”. The idea is simply that it employs space that is already present in and on buildings. However, in comparison to conventional agriculture, which consumes thousands of acres of open landscape, ZFarming uses next to nothing in the way of square footage, especially when implemented on pre-existing rooftops. In their research, Thomaier et al. (2015) found that over 64% of all ZFarming practices in developed countries is comprised of rooftop farms or gardens (p. 45). In addition, almost 70% of ZFarms employ soil-based methods, which for rooftops entails “soil placed directly on rooftop” (p. 46). This often requires the use of greenroof technology such as greenhouses. While rooftops are integral to ZFarming, however, the very fact that they are pre-existing would raise concerns about their integrity. Depending on their age, they are limited in their ability to maintain a certain structural capacity in accepting soil and water loading. Repercussions of overloading could be disastrous, resulting in degradation in building integrity, or even roof collapse. To prevent this, Pfeiffer et al. (2013) suggest use of lightweight soil or soilless alternatives, which include “expanded slate, shale, or clay mixed with sand and compost” as well as “coir [coconut fiber] based potting material” (p. 87). Another alternative technique to soil loading is hydroponics, a soilless method of growing plants in a “nutrient solution root medium” (Hydroponics, 2016). Because of its need for such unique materials and unconventional methods, ZFarming is “characterized by demanding high standards of technology, maintenance, operation, and investment,” especially in “early stages of development” (Specht et al., 2014, p. 34). However, Oberndorfer et al. (2007) observed that green roofs experienced a fraction of the heat flow experienced by a roof void of plants, specifically in the heat of summer (p. 828). This in turn lowers the “energy demands of the building’s cooling system” (p. 828). In addition, Oberndorfer et al. (2007) found that have plants on a rooftop reflects some of the ultraviolet radiation away from the surface, prolonging the life of its waterproofing membrane (p. 828). In mediating the daily temperature change of the rooftop, plants also kept the membrane from expanding and shrinking enough to cause itself damage (p. 828). The services of cooling, insulation, and deflection of radiation lower the amount of energy required to maintain the internal equilibrium of the building. This helps to offset the aforementioned cost of installation. Thus, the value of the input for rooftop ZFarming heightens the value of the output and the resulting payback. Vertical farming is a specific type of zero-acreage farming that directly addresses the space problem, following along the lines of all other kinds of urban architecture by building upwards. Despommier (2013) discusses a specific type of indoor vertical farming, called “controlled environmental agriculture (CEA),” which takes full advantage of modern technology (p. 388). It employs the use of the aforementioned hydroponics in place of soil and “spectrum-specific, higher efficiency light-emitting diode (LED) grow lights” (p. 388). Vertical farming as a method of ZFarming is unique in that it is aimed at “reducing greatly the architectural footprint,” of growing food (p. 389). It is also unique from other types of ZFarming in that, unlike the previously discussed small-scale community farms and rooftop gardens, it is already massively commercialized (p. 388). It seems that because of this commercialization, vertical farming also maintains the highest potential out of all the other urban farming approaches, “for large-scale production of a wide variety of crops in close proximity to, or even within, urban centers” (p. 388). On the subject of fertilizers, Despommier discusses the dangers of contamination when using byproducts of human feces (p. 388). While the soilless approach of hydroponics still requires fertilizers, the need for irrigation, and so also the potential use of storm water, is eliminated. However, while the danger of contamination is reduced, so also is the potential for the integration of regenerative methods into the system of vertical farming. These “high-tech vertical greenhouses,” however, are systems within themselves (Despommier, 2013, p. 389). With them comes the promise of the development of a largescale system that can be implemented in cities across the board. Zero-acreage farming is not without its own disadvantages and limitations. The timely development of new technologies and techniques required to fully realize this sort of farming seems to be the greatest of these, along with timely funding (Thomaier et al., 2015, p. 46). The fact that ZFarms are likely to be community endeavors, does present the possibility of crowdfunding, donations, investments, grants, and unpaid labor to maintain them (Thomaier et al., 2015, p. 46). ZFarming practices may also lack elements crucial to sustainability. In addition, most methods employed in ZFarming are engineered for small-scale application and usually prove to be costly (Thomaier et al., 2015, p. 46). They are also not always certified as organic (p. 46). 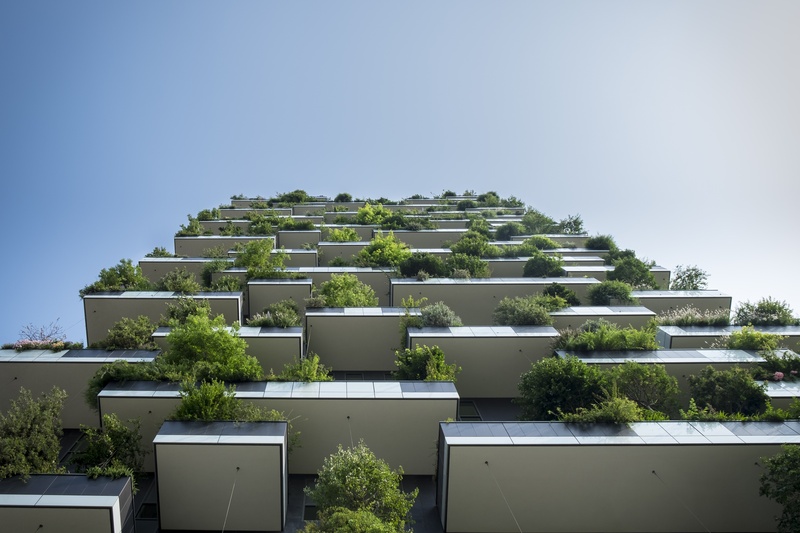 While vertical farming specifically may seem the closest of all the options to large-scale potential and impactful implementation, it is by no means exempt from the previous statement. Its use of hydroponics and artificial lighting if anything makes it the least organic out of all the approaches. And yet, it appears to be one of the most viable options currently available for effective food production. While it could potentially provide the same pollution-mitigating functions as discussed with the benefits of urban agriculture, vertical farming’s use of artificial methods is a movement away from the natural process many other approaches like biointensive growth and permaculture are engineered to maintain. The dilemma presented is between a technologically-advanced methodology, or one that is more naturally-oriented and focused on using what is already present within a system to achieve maximum sustainability in food production. The dilemma seems to be also between effective, largescale, most likely commercial implementation, or regenerative farming centered on a local volunteer pool and community. Regardless of the choice, the fact remains that farms and cities are crucial to maintaining the human population in a sustainable way. They do not, however, need to be kept separate. Indeed, integrating the two may have far-reaching benefits. Among these are the mitigation of the effects human activities are having on the environment. Such ecological services as deflecting solar radiation, absorbing carbon emissions, and storm water purification are already performed by naturally occurring systems. Placing such agents in areas where human activities are most concentrated takes full advantage of these functions. While urban agriculture holds the promise of a more local and sustainable way to grow food, it is not an undisputed concept. Its limitations stem from foreseen difficulties in implementation. These include the variability of space in urban areas and obstacles in creating and maintaining a suitable environment for growing plants in such a way that the output of food and other services will offset the cost of implementation. New methodologies arise in answer to these concerns, ideas such as vertical farming technology and an organic, permacultural approach. As humans, we are set apart from the rest of life on Earth because of our intelligence and capacity to progress. Because of our ever-growing population, cities are fast becoming a common theme of modern civilization. Many would agree that having green spaces in cities is “something so essential for the urban quality of life” (van Leeuwen, 2010, p. 23). Thus, it should not become a movement away from nature, but rather a system centered on co-existence with it. Urban agriculture could be just one step on the journey toward achieving this relationship. AgRecycle: From Forgotten to Fertile. 2010. Retrieved November 16, 2016, from http://agrecycle.com/. Akhtar F, Lodhi SA, Khan SS, Sarwar F, Incorporating permaculture and strategic management for sustainable ecological resource management. Journal of Environmental Management. 2016 Sept 179, 31-37. Retrieved October 4, 2016, from ScienceDirect. Angotti, T. (2015, April). Urban agriculture: Long-term strategy or impossible dream? Lessons from Prospect Farm in Brooklyn, New York. Public Health, 129(4), 336-341. Retrieved October 4, 2016, from ScienceDirect. Cohen, N., & Reynolds, K. (2015, February). Resource needs for a socially just and sustainable urban agriculture system: Lessons from New York City. Renewable Agriculture and Food Systems, Suppl. Innovations and Trends in Sustainable Urban Agriculture, 30(1), 103-114. Retrieved October 3, 2016, from ProQuest Central. DeLind, L. B. (2015, February). Where have all the houses (among other things) gone? Some critical reflections on urban agriculture. Renewable Agriculture and Food Systems, Suppl. Innovations and Trends in Sustainable Urban Argiculture, 30(1), 3-7. Retrieved October 3, 2016, from ProQuest Central. Despommier, D. (2013, July). Farming up the city: The rise of urban vertical farms. Trends in Biotechnology, 31(7), 388-389. Retrieved October 3, 2016, from ProQuest Central. Diver, S. (2014, August 28). Introduction to Permaculture: Concepts and Resources. Retrieved November 2, 2016, from https://attra.ncat.org/attra-pub/viewhtml.php?id=298. Ecology Action. (2006). Retrieved November 01, 2016, from http://www.growbiointensive.org/grow_main.html. George, K., Bunce, J. A., Quebedeaux, B., & Hom, J. L., et al. (2009, March). Macroclimate associated with urbanization increases the rate of secondary succession from fallow soil. Oecologia, 159(3), 637-647. Retrieved October 3, 2016, from ProQuest Central. Kessler, R. (2013, November). Urban Gardening: Managing the Risks of Contaminated Soil. Environmental Health Perspectives, 121(11-12), A326-A333. Retrieved October 3, 2016, from ProQuest Central. LaCroix, C. J. (2014, Spring). Urban Agriculture and the Environment. The Urban Lawyer, 46(2), 227-248. Retrieved October 3, 2016, from ProQuest Central. Leake, J. R., Adam-Bradford, A., & Rigby, J. E. (2009). Health benefits of ‘grow your own’ food in urban areas: implications for contaminated land risk assessment and risk management? Environmental Health, 8(Suppl 1), 1-6. Retrieved November 1, 2016, from EBSCOhost GreenFILE. Oberndorfer, E., Lundholm, J., Bass, B., Coffman, R. R., Doshi, H., Dunnett, N., Gaffin, S., Köhler, M., Liu, K. K. Y., & Rowe, B. (2007, November). Green Roofs as Urban Ecosystems: Ecological Structure, Functions, and Services. BioScience, 57(10), 823-833. Retrieved November 8, 2016, from Oxford Journals. Pfeiffer, A., Silva, E., & Colquhoun, J. (2013, December 6). Innovation in urban agricultural practices: Responding to diverse production environments. Renewable Agriculture and Food Systems, 30(1), 79-91. Retrieved October 2, 2016, from ProQuest Central. Rhodes, C. J. (2015, December). Permaculture: Regenerative – not merely sustainable. Science Progress, 98(4), 403-412. Retrieved October 4, 2016, from ProQuest Central. Sethi, V. P. (2009, March-September). On the selection of shape and orientation of a greenhouse for composite climates. International Journal of Sustainable Energy, 28(1-3), 45-58. Retrieved November 1, 2016, from EBSCOhost GreenFILE. Smith, S. W. (2008, May). From farm to city: Using agricultural supplies to irrigate urban landscapes. American Water Works Association, 100(5), 96-101. Retrieved October 2, 2016, from ProQuest Central. Specht, K., Siebert, R., Hartmann, I., & Freisinger, U. B., et al. (2014, March). Urban agriculture of the future: An overview of sustainability aspects of food production in and on buildings. Agriculture and Human Values, 31(1), 33-51. Retrieved October 3, 2016. Thomaier, S., Specht, K., Henckel, D., Dierich, A., & Siebert, R., et al. (2015, February). Farming in and on urban buildings: Present practice and specific novelties of Zero-Acreage Farming (ZFarming). Renewable Agriculture and Food Systems, Suppl. Innovations and Trends in Sustainable Urban Argiculture, 30(1), 43-54. Retrieved October 3, 2016, from ProQuest Central. Urban Agriculture. (2016). Retrieved October 30, 2016, from https://www.nal.usda.gov/afsic/urban-agriculture. Van Leeuwen, E., Nijkamp, P., & Vaz, T. (2010). The multifunctional use of urban greenspace. International Journal of Agricultural Sustainability, 8(1/2), 20-25. Retrieved October 3, 2016. Whittinghill, L. J., Hsueh, D., Culligan, P., & Plunz, R. (2016, June). Stormwater performance of a full scale rooftop farm: Runoff water quality. Ecological Engineering, 91, 195-206. Retrieved October 4, 2016, from ScienceDirect.